Keep calm and carry on caravanning and motorhoming this autumn and winter? 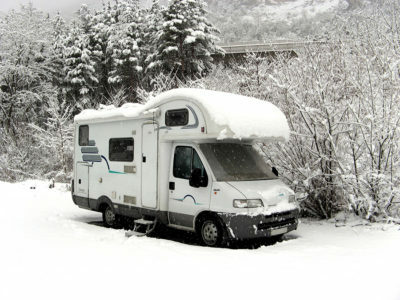 There are plenty of ways to keep warm in your ‘van when the temperature drops outside. Extra rugs and blankets? More clothing? Hat and gloves? Hot water bottles? An electric blanket, even? An extra heater, maybe? There are plenty of ways to keep cosy in your caravan or motorhome when you’re away in autumn and winter. True, you’ll want to resort to the heating system, for starters. But, you might also want to supplement that with an extra heater. Just keep an eye on your electrical consumption, though. Make sure there’s plenty of space around any heater – for safety and to allow it to heat the surrounding area properly. Ventilation is important. At least some upper and lower level venting will help prevent any build-up of condensation, or worse. Don’t block vent holes for gas pipework etc. Leave any heater to cool down properly before packing it away. Why not invite some friends around? They’ll soon warm up the place! Never be tempted to use your cooker for heating (although preparing a meal on-board will generate some extra warmth). Consider the supply of campsite hookup. Many offer 10 or 16 Amps. 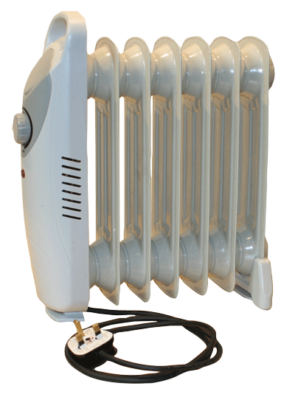 A 1kw (or 1000 watt) fan heater or radiator uses 4 amps, so running a 2kw fan (using 8 amps) might not allow for much else to be switched on in caravan at the same time without tripping the system. Providing you have the space to put it where it won’t get in the way, and dissipate its heat most effectively, this can be a real boon. It’s 33cm x 39cm x 10cm, weighs some 4.15kg and comes with wide feet to prevent it from getting knocked over accidentally. Plus there’s a carry handle. The adjustable thermostat keeps you in control so, apart, from the occasional noise of the oil circulating, it’s safe for keeping on through the night. This certainly lives up to its name. 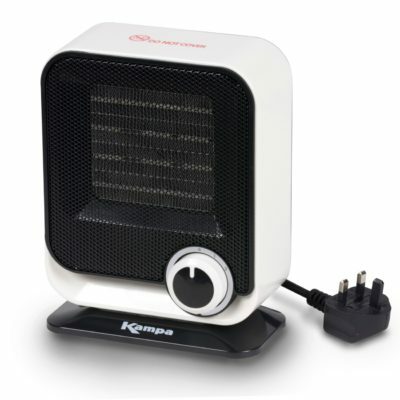 It’s an electric fan heater, just 21.5cm tall, but it pushes out heat via two settings – 750W and 1,500W. It’s supplied with a UK plug (although it can be ordered with a continental two-pin) and it’s all-plastic casing means it stays cool to the touch. Definitely not suitable for use in your caravan or motorhome, but here’s an effective way of taking the edge off any chills in your awning. 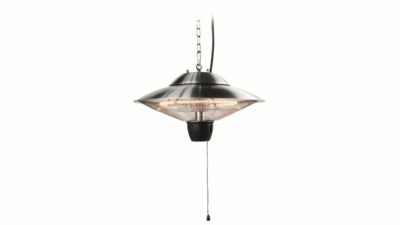 It relies on a mains connection, with a halogen element providing almost instant heat once you’ve found somewhere suitable to hang it from. It also gives a glow of ambient light. There are two heat settings – 600W and 1,500W. The main unit has a 42.5cm diameter and weighs 1.4kg. If you have a Truma blown air heating system in your vehicle, you might want to extend it into your awning. The Awning Warmer is an extra outlet with ducting, so you can channel heat outside – ideal if you prefer sitting in your awning and/or have pets staying here. 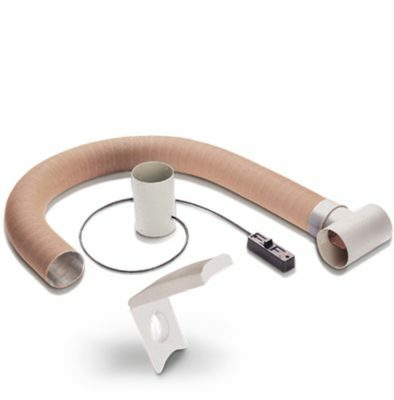 The full kit comprises ducting, T-piece, air outlet with flap and shut-off. To be fair, owners report mixed results, some pointing out it takes the edge off any real cold in the awning, including reducing moisture, others noting it takes heat away from your main living unit. Its efficiency seems to depend on the location of the main heater unit, too. If you look on ebay you will find dome 12 v heaters, but at 150 watts, you would not be able to run them for long on. They are designed to be used with the engine running, in which case you can use the engine heater. A more expensive heater using vehicle fuel and a 12 electric to run the fan is anEberspacher D2, boat, motorhome, diesel night heater, around £250 on ebay.